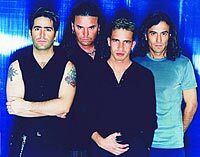 When asked early in his career what he'd want Maná to be, lead singer Fher answered he wanted it to be the biggest band in the world. Maná is certainly close to that goal. In 1999, the band became the first rock en Español group to sell 500,000 copies of its hit album Sueños Liquidos in the States. The band received its biggest exposure Stateside by winning a number of Grammy Awards for their collaboration with Carlos Santana on his star-studded album, Supernatural. In Latin America, the band towers over the music scene, topping the charts and selling millions of albums. Maná hail from Guadalajara, Mexico, and like many other Latin bands, its music combines Caribbean and Latin rhythms with rock. The band's radio-friendly mainstream rock music has drawn comparrisons to mid-80s rockers the Outfield. Maná has performed in more than 22 countries, including the United States, most notably opening for Santana in 1999.